Looking to ramp up its already successful R&D commercialisation program, IHI began investigating potential new approaches to better capture and integrate the expertise from across all its departments into strategy and innovation planning. Dr Hiroyuki Nose, Manager at IHI’s Technology Planning Department, said: “IHI has a long and successful tradition of developing innovations and we wanted to further increase our successful commercialisation of R&D by improving strategic dialogues within and between our internal departments and with external stakeholders to develop new co-created solutions. We needed a structured and interactive approach to include key stakeholders of the company in our innovation and strategy planning “. IHI approached the Institute for Manufacturing (IfM) at the University of Cambridge, which is a world centre of excellence for roadmapping and has helped more than 3000 public and private sector organisations with their strategic and technology innovation planning using its research-based roadmapping techniques. 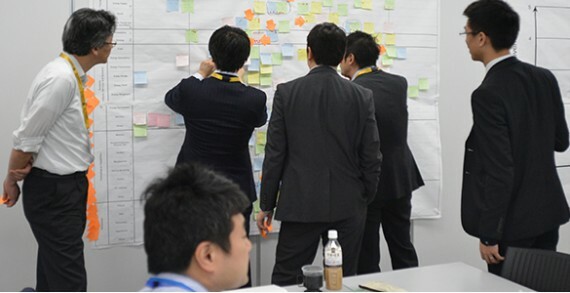 IfM identified that the graphical nature of roadmapping would be a particularly useful tool for IHI to communicate and discuss strategies with people from different departments and across different levels of the company.